Image by Brakspear, licensed under the Creative Commons Attribution 2.0 Generic license.. The beginnings of Watford football club can be traced back to the years when Gladstone was Prime Minister. In December 1870, the Watford Observer carried a report on Hertfordshire Rangers – the forerunners of Watford Rovers. Watford Rovers was formed by a group of lads in 1881 who had been given permission by the Earl of Essex to kick a football around in Cassiobury Park. In 1882, home games began in Vicarage Meadow and a year later, the club’s name was changed to West Herts. In 1898, a rival club, Watford St Mary’s, was absorbed by West Herts and the name ‘Watford’ was formerly adopted. 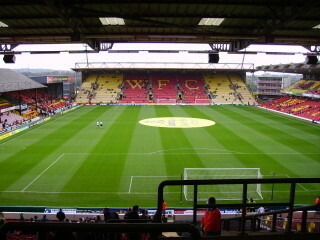 By 1922, Vicarage Road was officially the new home ground.